Ok having a brain fart...cant get my Warhead amp to play through the cab. I know the cab works, I was just playing a RG100ES through it. I haven't used the Warhead (head) in over a year. Last time I was used, it I know there was a trick to getting it to work (as I was about to return it, until I figured it out). Anyone have any idea what I'm missing?? Some sound does come out of the cab on the "crunch" channel, but it is very very quiet. 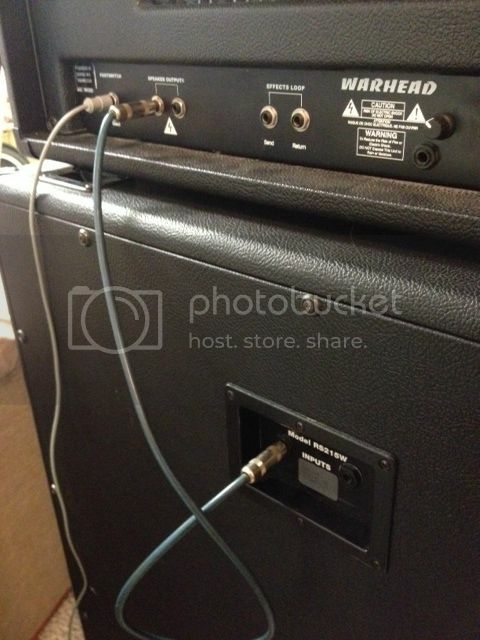 Below is a picture of how I have it hooked up (guitar input on front of amp). Buy some contact cleaner and a patch cable. Spray the contact cleaner into the effects send and effects return jacks. Spray the plug of the patch cable, and then run the plug in and out of the effects send and effects return jacks a bunch of times. It might take a couple of hours before you get good results. Lastly bridge the effects loop with the patch cable to keep junk from getting in there, and to keep a good signal going. Hopefully it solves your problem.